The comics sales estimates for July 2015 are now online here at Comichron, completing the picture reported Friday of a slightly off month for new comics orders, influenced at least partially by a lower number of new comic book releases. 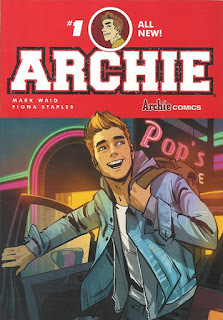 There were seven titles with sales over 100,000 copies, including the relaunched Archie #1 which squeaked past that mark with 101,488 copies ordered. It's the main Archie title's highest ranking for a title in the Diamond era; issue #600 back in August 2009 placed 35th with 54,000 copies ordered. Life with Archie #36 back last July hit 27th with 57,000 copies ordered. The main Archie title was the #1 book in the industry back in 1969, thanks to the cartoon series and the "Sugar, Sugar" hit single. Click to see the complete postal sales history for the Archie title. Marvel's Star Wars #1 appeared again in the Top 300, bringing the total number of copies ordered since January to 1.029 million copies. The total is likely higher because of reorders during other months which did not make the Top 300 chart. The average cover price of the comic books in Diamond's Top 300 was $3.88; the weighted average was also $3.88. The median and most common price points were $3.99. Click to see cover prices across time. Apologies for the delay in this month's report: I was at Shore Leave Convention in Maryland, where I announced the Star Trey: Prey trilogy of novels I'm writing for Pocket Books for 2016, the 50th anniversary year of Star Trek. 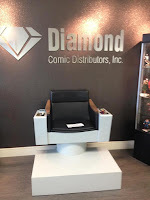 I also dropped by Diamond Comic Distributors headquarters—thanks to Allyn Gibson for the invite and also for appearing on our comics panel at the convention.